← New Tazwell, Tennessee. June 23rd, 2011. Lake Stevens, Washington. June 24th, 2011. A small sinkhole has closed the eastbound lanes of Highway 204 in Lake Stevens, state transportation officials report. The sinkhole, which appeared Friday at the Highway 204 intersection with 81st Avenue SE, apparently was caused by an inactive sewer line under the roadway, officials said. A state Department of Transportation spokesperson said both eastbound lanes of the highway are closed. Eastbound traffic is using one of the westbound lanes, with one lane of traffic in each direction. Officials weren’t able to say when the eastbound lanes might reopen. The sewer line was installed for the new plant in Lake Stevens, but hasn’t yet been used. 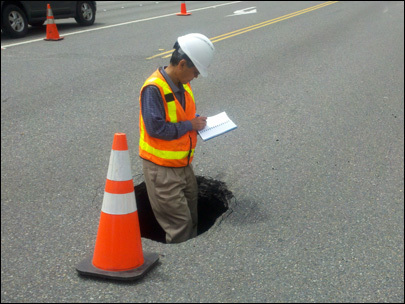 This entry was posted in Pictures and tagged sinkhole, Washington. Bookmark the permalink.